A 40-foot humpback whale spotted trailing debris off the Big Island last Thursday was cut free Sunday. A 40-foot humpback whale that had been dragging marine debris around since at least Thursday is swimming freely now, thanks to workers who freed the whale of rope and buoys north of Lanai on Sunday. The adult whale was first spotted trailing four strands of rope -- the longest about 28 feet -- and bright orange inflatable buoys off the coast of the Big Island on Thursday by researchers with the Hawaii Marine Mammal Consortium, said Ed Lyman, marine mammal response manager for the Hawaiian Islands Humpback Whale National Marine Sanctuary. 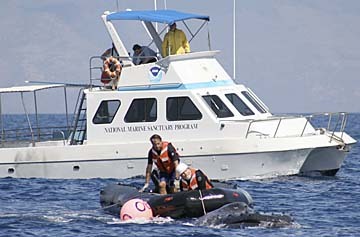 The researchers contacted the sanctuary, which was able to attach a VHF tracking buoy to the debris hanging off the whale with a grappling hook, Lyman said. The whale then took off for rough water before removal of the debris could be coordinated. It wasn't until Sunday that the signal from the transmitter popped up again in an area with calm conditions conducive to a detangling effort. The whale-watching vessel Paragon spotted the whale at 8:45 a.m. Sunday, and the cooperative Whale Disentanglement Network sprang into action, Lyman said. By 10:30 a.m., eight trained crew including the Maui-based Lyman, a 21-foot boat and a 40-foot boat had assembled near the whale and assessed how best to help it, he said. David Mattila, foreground, and Ed Lyman of the Hawaiian Islands Humpback Whale National Marine Sanctuary "keg" the whale -- a technique that involves attaching floats to slow the animal -- so they can free it. They actually used an old whaling technique called "kegging," Lyman said. By attaching rope with more plastic floats to the debris the whale was already pulling, they were able to create more drag, slow the animal down and get close enough to carefully cut the debris loose with special hook knives on poles, he said. Once the whale was released from the debris, it swam off, seemingly in good shape, and approached another group of whales, Lyman said. Entanglement can kill a whale through direct physical trauma or infection if ropes cut into its skin, and make it more susceptible to being hit by a boat or starving, Lyman said. "We don't know how long this whale had been carrying gear," he said. 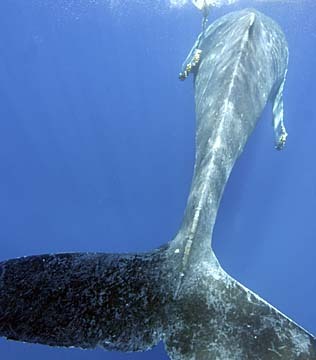 The "take-home message" for Hawaii boaters is: Don't try this yourself, but do call the National Oceanic and Atmospheric Administration's toll-free hot line and report whales or other marine mammals entangled in nets or debris, said Naomi McIntosh, whale sanctuary manager. Sunday's rescue is the first successful disentanglement of the current humpback whale season, and the first ever in Hawaii using VHF tracking buoy to find an entangled animal, said Lyman, who formerly used radio tracking to find entangled whales on the East Coast. Two other humpback whale entanglements have been reported in the current Hawaii whale season, Lyman said. The first, off Kauai on Dec. 27, was determined not to be life threatening, so the animal was left alone. The second, Jan. 29 off the Big Island, looked more serious, but the animal couldn't be relocated, he said. To report a humpback whale entangled in marine debris, call the National Oceanic and Atmospheric Administration Fisheries hot line toll-free at (888) 256-9840. To learn more about humpback whales, the volunteer whale counts Feb. 25 and March 25, and free educational events on every island, visit the Hawaiian Islands Humpback Whale National Marine Sanctuary Web Site at hawaiihumpbackwhale.noaa.gov.